I was recently asked a series of archery questions by a reporter from the National Post, a Canadian newspaper. The questions pertained to a recent episode of the popular television show "Game of Thrones", episode 9 of season 6 during which the character Ramsay Bolton (formerly Ramsay Snow) displayed his impressive archery skills. SPOILER ALERT - If you have not seen the recent episodes of Game of Thrones you may want to watch the episode in question before reading any further. How far would Ramsay, the shooter, have to be to successfully target the victim? How far would be too far? And how long would this shot typically take? How fast do you believe the arrow is moving? What style of arrow and method of shooting is Ramsay using, and do you think these are good choices considering what he is about to do? Would the arrow continue moving in a straight path at this distance? Would his victim have been able to “zig-zag” and avoid it, in other words? Ah yes, the scene with the Penobscot bow. I was very happy when I saw that. 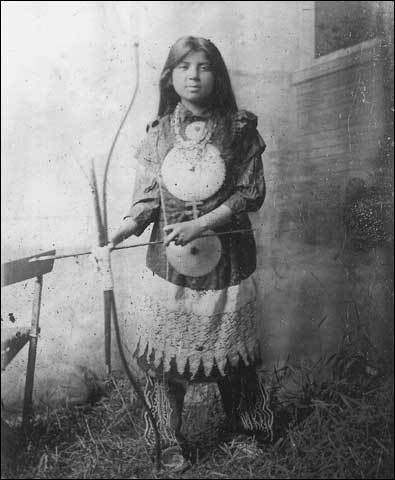 The Penobscot are a Aboriginal American tribe who used "double limbed flatbows" which have extra cables attached to extra limbs on the bottom and top of the bow, which allows the archer to adjust their tiller and weight by shortening/lengthening the cables by twisting the cables to tighten or loosen the cables. The adjustability and added power makes the arrows go further with a longer arc, which ultimately leads to more accuracy at longer distances. Normally Ramsay in the TV show is seen with a Hungarian style horsebow, a type of shortbow which is not known for its long range accuracy, but by switching to a Penobscot bow he gets added range and accuracy. As a fan of the Penobscot bow, it was very nice seeing it being used in the show. Depending on the archer and the power (measured in poundage) of the bow, he could be pretty far away. Howard Hill once shot a bald eagle at 150 yards away, which is twice the distance modern Olympic archers shoot at. Rickon is a lot bigger than a bald eagle however, but I would estimate he was about 100-120 yards away when the fatal arrow hit him. Ramsay showing off, deliberately missing. Judging by Ramsay's previous skill shown in the TV show, this is not impossible. I would say Ramsay is likely "reasonable accurate" out to a distance of 120 yards when shooting at a man sized target. 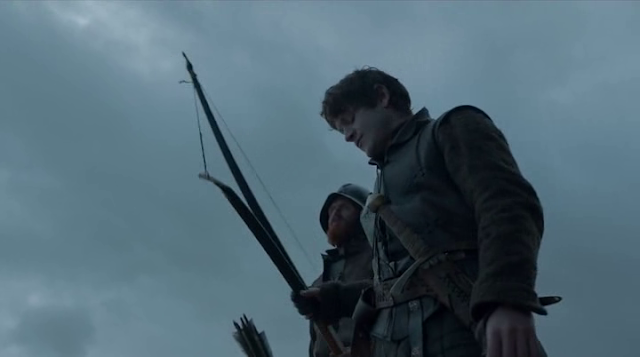 Ramsay's skill is quite good and he even shows off a bit by looking away during one shot and deliberately missing. Judging by the camera angles and the size of people in the distance I think the two opposing forces were about 200 to 250 yards apart. To nock, draw and aim - only a few seconds. You would not want to be holding it for a long time when aiming at a moving target, as the character Ramsay likely would have tuned to the Penobscot to his ideal poundage for the utmost accuracy and speed. The arrow was likely traveling between 200 to 250 feet per second (fps) on release. Regarding the precise arrow speed I am basing that on the estimate that Ramsay might have tuned the Penobscot bow to approx. 80 lbs, the higher the poundage the more power and speed released initially. Based on Ramsay's physical size, his youth and the fact he has clearly been shooting a very long time, 80 lbs seems like a reasonable amount. 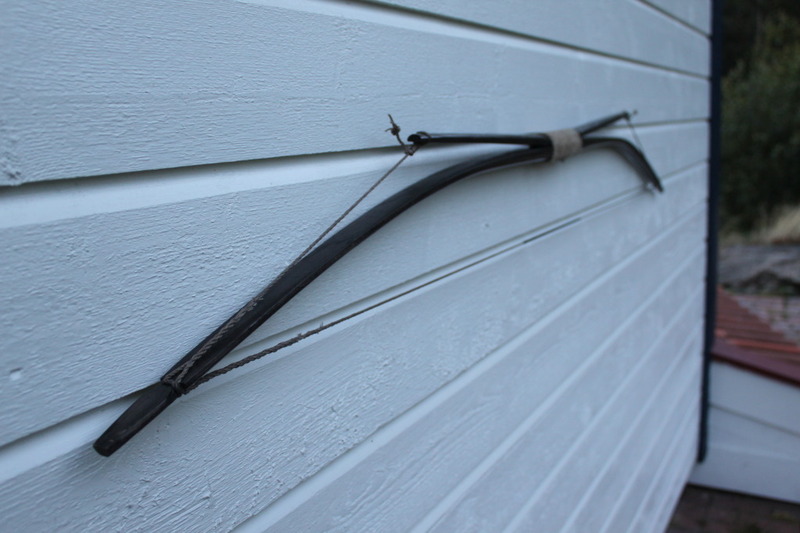 Historically any bow used for war would be a much higher poundage than any bow used for hunting or recreation. To put this in context 80 lbs is the bare minimum for an English warbow, which is more powerful than the standard English longbow. Longbows for adults are *usually* in the range of 20 to 80 lbs. English Warbows are usually in the range of 80 to 200 lbs. For example Howard Hill once used a 173 lb now while hunting a bull elephant in Africa, which admittedly was overkill in terms of power. A typical hunting bow in Ontario is between 40 to 70 lbs, stipulated because the minimum legal poundage for bowhunting deer is 39.7 lbs and for moose/elk/black bear the minimum is 48.5 lbs. A bow that is only 20 - 30 lbs of draw weight in contrast would have a speed of approx. 100 to 125 fps. Only a fraction of what a Penobscot bow is capable of. Ramsay appears to be using a wooden arrow with long turkey feather fletching (for added accuracy on non-windy days, less accuracy on windy days). The arrowhead appears to be a moderately heavy traditional broadhead. He would not want an arrowhead that is too heavy as that would reduce his long distance accuracy, so he has chosen one that is relatively narrow and saves on weight. Ramsay is using a style of archery similar to the Howard Hill style of shooting (this is how famous Howard Hill is, he has an archery style named after him). Howard Hill would also lean forward and into the shot slightly, aligning his body with the angle of the bow. The style is popular with longbow and flatbow archers, and bears similarities to Mongolian, Persian, Turkish and Hungarian archery styles. The style involves deliberately canting (changing the angle) of the top limb of the bow to the side so you get a cleaner view of the target and it compensates for the sideways motion of the arrow - without the cant the arrow would tend to go further to the side, but the cant allows the archer to be able to compensate for the difference and makes it easier to aim at their target. As longbow archery styles go, there are three common styles you may have seen previously: English Longbow Style (no cant, shooting long distance in volleys because of reduced accuracy), Japanese Kyudo (no cant, but with significant stylistic differences in form and release), and the Howard Hill style of shooting. Of these three styles, the Howard Hill style makes the most sense, plus since he has already been seen shooting Hungarian style horsebows, it is not so different from the style of shooting he does regularly. So yes, a moderately weighted arrowhead with a long fletched arrow, using a Howard Hill style cant makes total sense to get the most accuracy. The arrow would be traveling in a straight arc, so yes, it would be straight and arcing downwards. 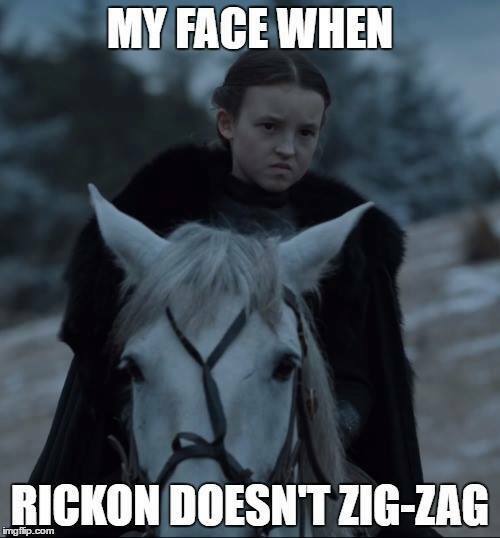 In theory, yes, Rickon would have been able to zig zag at that distance and dramatically reduce the chances of Ramsay hitting him, but Rickon clearly was not thinking that. He also did not think to run behind the burning crosses and let the heat rising from the crosses change the view of the target so that it was blurry and more difficult to aim at. So if he had thought to zig zag behind the crosses, his chances of survival would have shot way up. I should note that in the TV show Stark children who have their wolf killed somehow have a tendency to die. Sansa is the only character who has had her wolf die a long time ago and has not yet died. She has so far bucked the trend, which makes me wonder if she is doomed. Rickon was clearly doomed the moment he got captured and his wolf was killed. Robb got separated from his wolf during the Red Wedding and it was locked in a kennel, thus signaling his death was imminent. Arya is fortunate that her wolf is still wandering the Riverlands. Bran only recently lost his wolf on the TV show (not in the books) so it will be interesting to see if he also dies sometime. 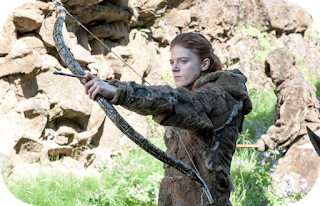 Check out Ygritte's bow that she had. It is a recurved replica of the Meare Heath bow, which is a famous example of ancient bow designs. Ramsay was taking his sweet time there between shots. He was in no rush. Had he wanted to he could have shot perhaps 10 times easily in the space of 1 minute, but instead he was patient and took his time about it. Which I think is part of his character. He takes his time and enjoys his sadistic pleasures. In contrast when he realizes he is in danger he manages to get three shots off at Jon before he starts getting punched in the face. That scene was shorter but was a better example of fast shooting. Send your questions to cardiotrek@gmail.com. More than happy to help answer questions. Thanks for sharing that, it was very interesting.